A mug of hot tea is the perfect antidote to a chilly winter day - but it can also be a miracle worker for your skin. Surprised? Don't be. The benefits of green tea can be attributed to its rich antioxidant content, which attack the free radicals responsible for a host of conditions, including skin inflammation and fine lines and wrinkles. It's certainly no secret that healthy skin is best achieved through a combination of methods. In addition to a targeted regimen that focuses on the right cleansers and moisturizers for your skin type, it's also essential to maintain a diet that encourages your skin's good health. We discovered what a difference it can make when we spoke to Yogi Tea senior research scientist and herbalist, Karta Purkh Singh Khalsa, about the company's new Skin DeTox tea. LoveToKnow: Thank you so much for taking the time to answer some questions! 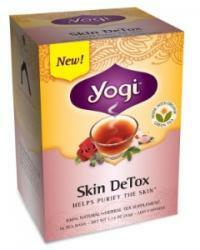 Yogi Skin DeTox is the newest addition to the already burgeoning Yogi lineup of health-conscious teas. What is this tea's specific purpose? Karta Purkh Singh Khalsa: Skin DeTox tea is purposefully formulated with delicious healing botanicals to detoxify the skin and organs which reduces inflammation and internal stress on the skin. LTK: Green tea's benefits are almost always mentioned when discussing a diet for healthy skin. How does green tea work to improve the skin's health? KPSK: Green tea is known for its high level of antioxidants. In Skin DeTox Tea, the green tea's antioxidants reduce skin inflammation. LTK: What specifically can it do that another beverage or food cannot? KPSK: The herbs and spices in Skin DeTox are uniquely combined to improve the complexion and foster a healthy, natural glow. Oregon grape root, burdock root, dandelion root and yellow dock root naturally flush toxins from the liver, while the red clover helps to gently rid the skin of allergens and irritants. The delicate floral flavor derived from rose petals and hibiscus flowers naturally soothes. LTK: What type of changes can individuals expect to see in their skin? KPSK: People can expect to see less inflammation, helping to achieve a more natural healthy glow. LTK: How often should one drink this tea to reap its rewards? KPSK: Drinking any amount of the tea has a positive effect. For the best results, we recommend drinking around six tea bags per day. Drinking more will not hurt and will likely help! LTK: Are organic consumables essential to maintaining good skin health? KPSK: Organics aren't necessarily essential; however, organics are less likely to contain noxious substances that can irritate skin. LTK: Would one see similar benefits through non-organic products, or is going organic especially key? KPSK: Non-organic herbs can also produce excellent results. Organic is always more desirable, when possible, for a variety of reasons. But the amount of healing herbs taken daily is very small, so organic is less of a factor than with food. LTK: In addition to making Skin DeTox a regular part of a daily regimen, what are your other tips for improving the skin's health?